Core business applications, often COBOL-based, are the lifeblood of organizations. Thriving in a competitive digital landscape means transforming the systems hosting core business processes. Extend application value with low-risk innovation. From a modernized, secure web and mobile experience, to process automation, to APIs, web services, and managed code models that support composite application delivery. Match enterprise application delivery speed to today’s required pace of change. Achieve DevOps-ready rapid application understanding, agile development, continuous testing, accelerated delivery, and controlled user access. Achieve flexibility, security, and cost efficiency by deploying applications across host, server, Cloud, and mobile, insulating valued IT systems from infrastructure changes while assuring access security, governance, and data protection controls. 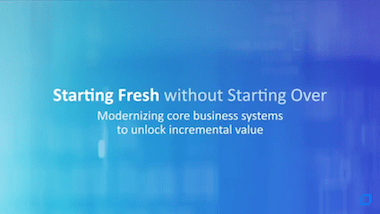 Achieve unprecedented speed to market, competitive advantage, and operational efficiency with Micro Focus’ enterprise application modernization and connectivity. Learn how to find new ways to improve application development and testing on the mainframe while controlling cost and risk. Learn how to manage cost and optimize resources where possible. Learn how to deliver new application functionality faster and deploy new workloads to Linux, Docker, and the Cloud. Learn how to provide the ability to report and analyze COBOL data using off-the-shelf tools such as Excel or Crystal Reports. Learn how to implement identity-powered multi-factor authentication, data encryption and masking to take back control of terminal access to applications and data. Learn how to web service-enable systems of record, fuel new enterprise Cloud apps, enable new digital workflow, process automation, and business models.